Hi, I’m Michelle, I’m a mother of three, my husband’s wife, and I got my first tattoo when I was 35. Would you like to know how a conservative Christian from the heart of the Bible Belt wound up with a rock-n-roll butterfly tattoo? Just a few years ago, I was having some serious issues with my self image, and it was wrecking my marriage. My dear hubby and I have been married for 14 years. We’ve been through all the usual fights and misunderstandings and trials that all couples go through. But I had a lot of baggage I needed to deal with. I had a very conservative upbringing. And since I was a very nerdy kid, I was too involved in school books to even consider dating as a teenager. I didn’t really start dating until college, and even then I was way too uptight to explore. I had dated a total of four guys by the time I met future-hubby. I was 19 and he was 36. He took two years to be sure that we were going to work before he proposed. We got pregnant about a year later. By our fifth anniversary our third child was on the way. In the midst of all the changes the pregnancies were making to my body, I automatically defaulted to my mother’s modeling. I spent all my time and energy on the babies and covered up my body. Adjusting to family life caused me to take very little care for myself. I call it being stuck in the “Mommy Mire,” and I completely lost myself in it for a while. When we moved to Florida, thousands of miles from the rest of our families, we continued to fight and tear each other apart. We were getting close to talking about divorce, and I fell into depression. There were days that I couldn’t function. I just wanted to pull the covers over my head and sleep to escape. NOT good. I hated what I had become and was desperate to change. All of the sudden I cracked, but in a very good way. Out of the blue it occurred to me to let go of the hang ups. All of the sudden I decided I liked who I was and what I looked like. That, in turn allowed me to begin to open up again to my sweet man. No doubt all of you guys know THAT went a long way to healing the issues between hubby and me. We started talking. Talking about what felt good, what we dreamed about, what we wanted; everything really. Talking got me back to writing. My very first short story was written as a birthday gift for hubby. He loved it so much and thought it was so well done, that he encouraged me to find a way to share it. Writing became a way for me to explore options I had never considered before. I reconnected with the flirtatious and teasing side of myself that I’d stuffed away for years. To say the least I had changed. I had changed in some pretty big ways and will never go back. And that was the inspiration for the butterfly tattoo. I gave up being a caterpillar, broke free of the cocoon, and now I have wings on which I intend to soar. And since I don’t ever want to go back I made a change to myself in the way of a tattoo, so that I can’t ever physically be the same again. That was a little over a year ago now, and I’m seriously considering adding to that first tattoo. Like the first one there is a story to go with it. For a while I’ve been pondering adding to it just because I liked the first one. It appeals to the creative, artistic side of me. I’ve also wanted to memorialize how much living here has influenced me. I love the ocean and the tropical plants and weather. But it was the recent passing of my last living grandparent that gave me a reason to act on the impulse. I was very lucky growing up, because I lived very near one great-grandmother and both of my grandmothers. I was very close to them, and they all had a huge influence on my life. My great-grandmother lived long enough to see me get married. She passed away about seven months after the wedding when I was 22. Both of my grandmothers lived to get to know all of our children. My paternal grandmother passed away a few years ago not long after she turned 89. Just this last month my remaining grandmother passed on as the result of the slow progression of Parkinson’s Disease. As I said, all three of these women had a very strong influence in my life, so I decided to memorialize that with an addition of a tattoo. It didn’t take long once the decision was made to find just the prefect design. 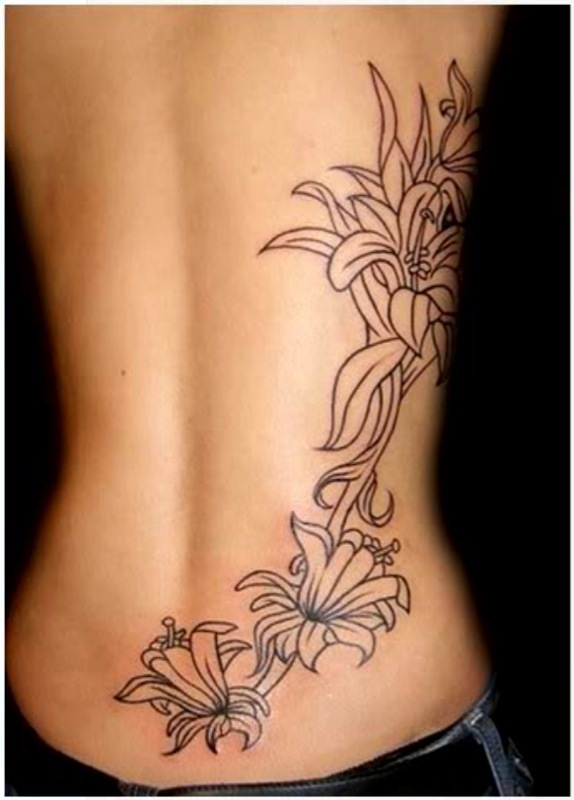 I wanted something tropical and all three of my grandmothers loved flowers. 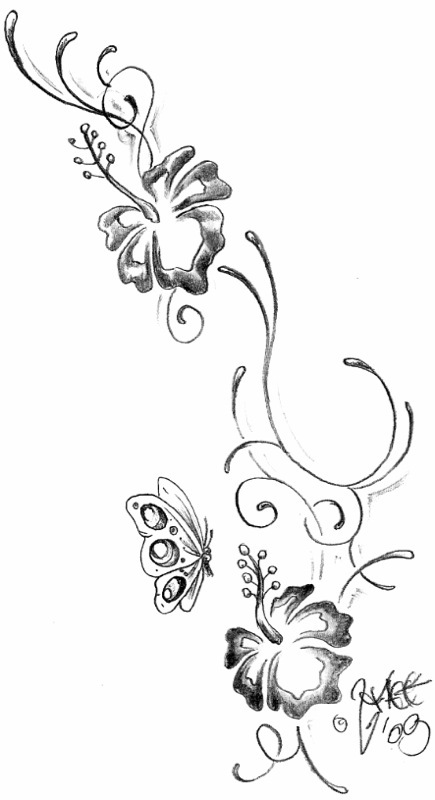 When I came across this design with hibiscus and a butterfly, I knew I had found what I was looking for. There are a few changes and additions I’d like to make for this to be perfect. I have three people I want to remember, so I need one more hibiscus. 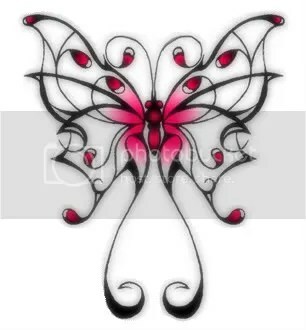 I’d also like the design of the butterfly to be adjusted to match the style of my existing butterfly. And, of course, it needs some color. I’m thinking pinks, yellows, oranges . . . shades of the beautiful Key West sunsets. All I need now is the right artist to take these elements and bring my tattoo to life. So the search begins to find someone in South Florida to make my plan a reality. With so many fantastic shops and lots of amazing artists here, I thought I’d bring you along for the journey. Every tattoo should have a good story behind it. It’s the law. Hope you are happy with yours. I think the design looks good. Be sure to see George Clooney’s “The American” for some ideas on butterfly tattoos. I have really enjoyed your story, Michelle. Thanks for telling this part of it. You may not have thought so from our previous contacts, idk, but I am also a conservative Christian, and had a very conservative upbringing. I am careful how I use the term “christian” these days, however, as so many regard it as either a synonym for “American” or something equally innocuous. I am a bit surprised, but interested, by your story of wanting tats, from a healthy state of mind. It is a learning opportunity for me, I guess. I just frankly do not understand why people wish, in a healthy state of mind, to alter their body, either with tats or piercings or cosmetic surgery (unless it be for health reasons). Of course, lol, heavy makeup seems to me to hide the natural beauty of the body that people have. So, because I respect your story, I am listening, and will undoubtedly have my horizons expanded. Thanks for writing, and for being you! "A Tattoo Story" was written September 17th, 2010	by Michelle Stinson Ross, and filed under Art and Culture, Leisure and tagged Art, butterflies, flowers, ink, life, Tattos.